On my Stampin’ UP! team I am blessed to have a few ladies who have achieved the title of Silver Elite. This simply means they are doing what I am doing. They are pursuing their passion as a business. I have watched each of them work hard, laugh, cry, be happy, be frustrated at times, and most of all I have watched them grow. All of my Silver Elite leaders are amazing women. Each of them giving something fantastic and unique to our team that I truly have found to be motivating and inspiring. These women are my tribe. They help me do my job better and frankly, they make me look like an awesome leader. The truth is they just support me and encourage me as much I do for them. I could not think of a better way to celebrate who they are than having a nice dinner and spending time together just the 4 of us. Sadly, one of our leaders could not attend the event, but she will be there in spirit and I’ve made a special point to take her to dinner near home. 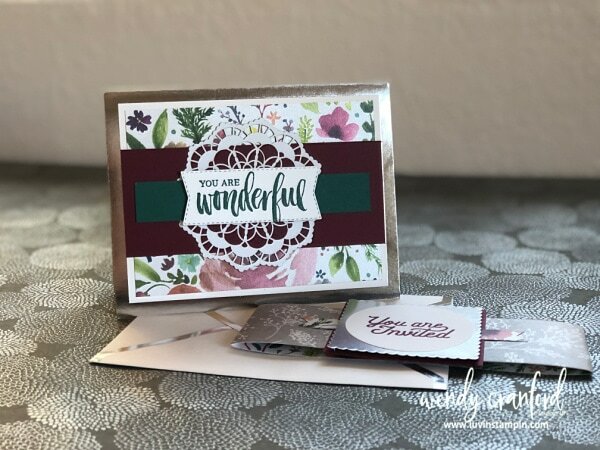 + FREE Stampin’ Anonymous tutorial bundle with 3 exclusive videos when you purchase $15 or more with me. New tutorials every month, created by 6 different amazing top Stampin’ UP! demonstrators. + Get Luvin’ Stampin’ Rewards each time you order $50 or more with me. Get 8 punches and choose $40 in product from me free, I will cover the shipping and tax too! CLICK HERE to download your form and track your orders. + Access to my Luvin’ Stampin’ VIP facebook group. There are weekly giveaways in this group beginning in November 2018. Supplies are listed below. Click on any of the images to purchase them in my online store.